Now you can combine two or more WorldCupAdvisor.com Performance Reports to create a blended report! Our new PPB (Personal Portfolio Builder) even lets you combine WCA programs with managed CTA programs available through authorized brokers. 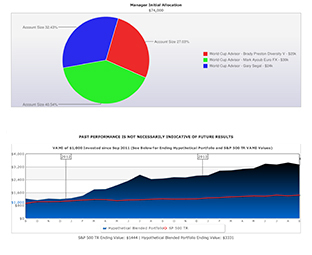 This powerful tool adds a new dimension to your ability to evaluate programs and customize your own investment portfolio. Trading futures involves significant risk loss and is not suitable for everyone. Past performance is not necessarily indicative of future results.